Home Life StyleGifts & Gadgets	If You’re a Dad Who Rocks, You’ll Love This Box! If your kids are gaming freaks the chances are you fall into one of two camps – the geeky dad that grabs the console and competes or the baffled one that looks at the screen bemused, presses the wrong buttons and gets attacked by zombies. As a mum of two I fall into the latter group, particularly with regard to Minecraft which to this day I fail to get. But my son’s knowledge of the game is encyclopaedic, his desire to play it borderline obsessive and the structures he create within it incredibly impressive. And when he came home from school with a note announcing I had 24 hours to fashion a costume for World Book Day, insisting he was Steve from Minecraft, you can imagine my joy. As every good parent does I scoured the selection on Amazon Prime to see what could be delivered in the timeframe and the only possible solution were overpriced and oversized pre-printed boxes, so I wrecked the house looking for an old box instead. So, it actually turned out no one was manufacturing blank BoxHeads anywhere in the world. Which is when I decided to take a punt. It wasn’t as easy or as cheap as you’d expect. Specialist box manufacturers were unable to help so I had to pay an expensive design agency to create a template for the box. My first batch of 100 were manufactured in the UK and largely sold in party packs to American moms who were wiling to pay more in postage than they did for the boxes. Having proven a need in the marketplace I then worked on logos and proper packaging and the first generation of BoxHeads came to be. They’ve sold well online and even better at events like Minevention in Ireland and The Digital Kids Show in the UK. Kids and parents love them and their creations at the shows have been amazing. What’s great about them is both types of parents – the gamers and the non-gamers – love them. 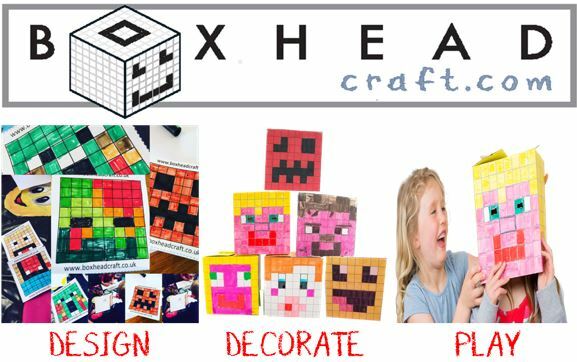 BoxHeads get kids off the console to craft and play. They give parents a well-earned break and the party packs come in well under the average kids party budget at just £60 a pop. Visit our shop bit.ly/BHCShop today!